Our language is critically endangered with fewer than 50 fluent Elders remaining. The Syilx Nation stretches across the Interior Plateau from Revelstoke BC to northern Washington. Nsyilxcn is an Interior Salish language. 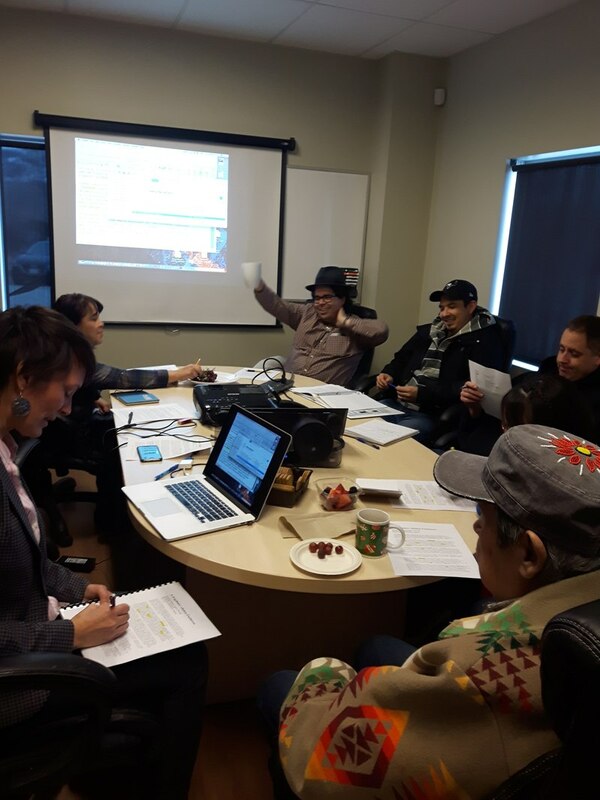 There are seven Syilx communities in Canada: Okanagan Indian Band OKIB, Westbank First Nation WFN, Penticton Indian Band PIB, Osoyoos Indian Band OIB, Lower Similkameen Indian Band LSIB, Upper Similkameen Indian Band USIB, Upper Nicola Indian Band UNIB, and the Colville Confederated Tribes CCT (WA), which includes Sinixt members. The Syilx Language House is centrally located in Penticton BC. Students travel from their communities to attend. The SLH is supported by our partners, the Penticton Indian Band, Westbank First Nation, Osoyoos Indian Band, First Peoples Culture Council, and in-kind contributions from OKIB, LSIB, and the Okanagan Nation Alliance. In September 2019 we plan to start 90 new students in three language houses across our Nation. The graduating students of the four year program in 2019 will be the teachers of the new cohort. Sʔímlaʔxʷ Michele Johnson PhD is lead teacher and Executive Director. ​Sʔímlaʔxʷ is a member of the Okanagan Indian Band, is related to the Simlas and Richters and also has Suyapíx (Euro) ancestry. She is a full time language activist, teacher and learner. She is a certified nłəqʷcin (intermediate speaking) teacher by Sʕamtíc̓aʔ Sarah Peterson and Chris Parkin of the Salish School of Spokane (Paul Creek). She completed a PhD in Indigenous language revitalization at UBC and post doctorate research at Simon Fraser University. When not studying and teaching she can be found hiking, mountain biking, and cross country skiing in the forests around Penticton. Qʷy̓qʷʕay̓áx̌n Levi Bent is Co-teacher and Elder recorder. He is a member of the Lower Similkameen Indian Band, resides in Penticton, and is a strong advocate for language and culture as well as being a leader and creative performer in community. Sk'awilx Sarah Alexis is Director of Communications, Development & Lobbying (2017-18). Sk'awilx is a member of the Okanagan Indian Band, and is a committed language learner, a biologist, activist, and a protector of water and Syilx ways. Səxʷc̓ksqlaw̓m Carla Ohmenzetter is our Bookkeeper. She is of German ancestry and a committed member of our team. By keeping our financial records, she gifts us the space to focus on language. As of September 2018, the start of Year 4, there are 8 learners, down from 14 students and 2 teachers March 1, 2017. In the past 2 years, three learners withdrew to have babies, two due to other pressures, and one to focus on mentor apprentice work. Not coincidentally, four of the students who withdrew were volunteer learners, with no financial support. Paul Creek curriculum is taught by two learners to a maximum of fifteen students, develops leadership skills and excellent teaching methods. Students are supported by Westbank First Nation, Penticton Indian Band, Sensisyusten School (WFN), Osoyoos Indian Band, School District 23 (Kelowna), and SLH. Students reside in PIB, WFN, Kelowna, OKIB, and OIB and commute to class. The names below are our language warriors currently enrolled in the program and their Band memberships.